As the month of June celebrates the Philippine Independence Day, Kulinarya Cooking Club’s challenge is all about a dish that’s ‘only in the Philippines’. 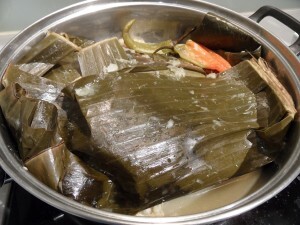 Choosing a unique dish is quite tough, not because of the strong influences from the Chinese, Spanish and Americans, but because I’ve always believed that one way or another a native Filipino dish has similarities with some other dish from our Southeast Asian neighbors. This is just my observation having lived in this region for almost a decade. Like tom yum for sinigang, sup tulang for nilaga or bulalo, pancit canton for mee goreng, belacan for bagoong or alamang, ketupat for suman or patupat, kueh kueh for sapin sapin. Of course, in most of these examples the spices differ big time. And with that in mind, I deduce that what spice up a dish somehow makes it unique. I have fond memories of the fish dishes I grew up with. These are the likes of sinaing and pinais, and the fish would be tulingan, tambakol, hiwas, tilapia, dulong or tawilis – cooked by my Batanguena mom. 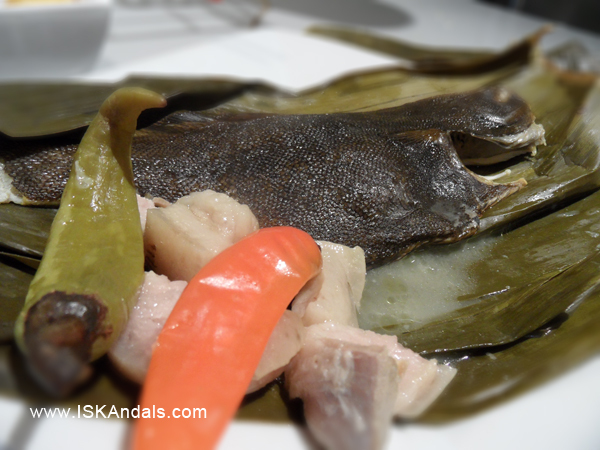 There might be a similar fish stew dish somewhere around the world and the fish may also be wrapped in banana or mustard leaves. But mom’s are, without fail, spiced with dried kamias (belimbi). With a tree in our backyard, we’ve always had a banig (hand-woven mat made of palm leaves) laid on the ground with lots of kamias to dry under the sun during summer. The dried fruits would be kept in sealed containers to last until the next summer. Weeks ago I told Erwin I haven’t really decided what to cook for KCC as it all depends on what I’d find at the market. Initially I was planning to cook mustard leaves-wrapped tuna steaks in coconut milk but I couldn’t find the right cut on the day I went to the fish market. So instead, I bought a couple of flounders that I normally steam with soy sauce and ginger. I was looking for a packet of fresh kamias from the Philippines, which I can find on a lucky day, but instead found frozen banana leaves from Thailand. Great. Pinais na isda it is. I would be extra-pleased if I could find fresh tamarind but for now I rely on the ever-available lemon. Mom’s pinais na isda involves handfuls of small fishes (dulong or tawilis) generously sprinkled with salt and wrapped together in banana leaves. These wraps will then be arranged in a claypot over chunks of pork fat and dried kamias, and totally immersed in water. The pot will be cooked over low heat, simmered for hours (at least 4 hours!) until there is enough patis (fish sauce) left. Cooked this way, you can eat the fish to the last bone, as bones and heads are soft enough to eat. The dish is best eaten with steamed rice soaked with the cooked patis. The rendered pork fat adds flavor to the salty, sour fish sauce. 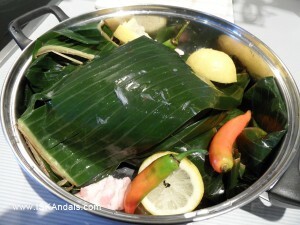 I remember the smell of heated banana leaves over flame, which we always do before wrapping the fish. Aside from that distinct banana leaf flavor, mom says the reason the small fishes are wrapped is to make sure they don’t move or disintegrate during cooking. The same thing applies with the flounders I bought, to make sure each fish still looks good when unwrapped. I also threw in some green and red chili to add flavor. In the many years I’ve lived outside the Philippines, which is surprisingly almost half of my life now, I’ve cooked these Batangas fish dishes whenever the craving comes. Tuna my personal choice and lemon my souring agent. Lay few chunks of pork fat on a banana leaf. Sprinkle fish generously with salt and place on top of pork chunks. Squeeze lemon juice on fish and arrange few slices of lemon on top. 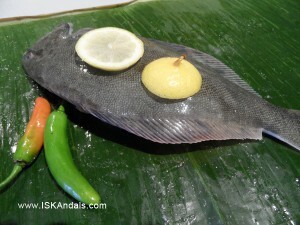 Add a chili or 2 next to the fish then carefully wrap with banana leaves. Repeat the procedure with the other flounder. 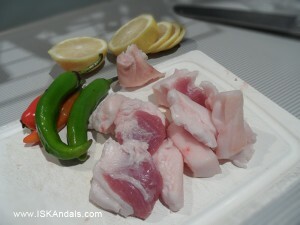 Arrange wrapped fish on a pot with pork fat chunks and chilis. Pour enough water to cover. Squeeze more lemon juice and sprinkle more salt all over. (Don’t be afraid to add more salt or lemon juice. You’re supposed to make fish sauce here.) You may throw in the lemon peel next to the wrapped fish or discard. Bring to boil then lower heat and simmer for 1-½ hours or until pork fat is melt-in-your-mouth tender. Remember not to dry up the stew; keep at least half a cup of fish sauce to drizzle on your steamed rice later. 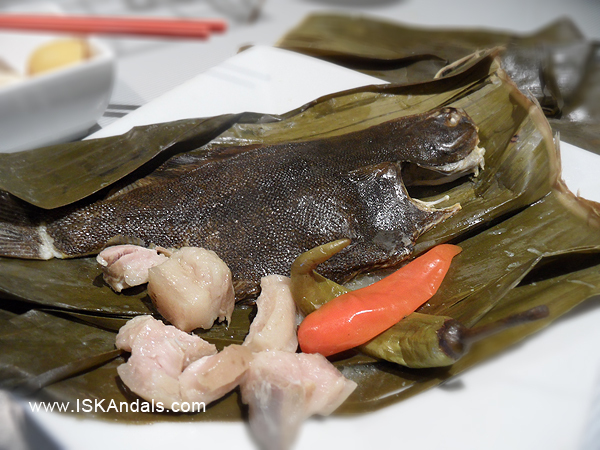 Carefully place banana leaf-wrapped fish in a platter and tear off the leaves to open. Serve as it is or discard the leaves. “Kulinarya Cooking Club was started by a group of Filipino foodies living in Sydney who are passionate about the Filipino culture and its colourful cuisine. - I didn’t heat the banana leaves over flame as I am using ceramic. - When you think the fish is almost ready, you may steam vegetables like okra, eggplant or beans on top of the wrapped fish to serve later. Serve them with chopped fresh tomatoes and drizzled with cooked fish sauce. 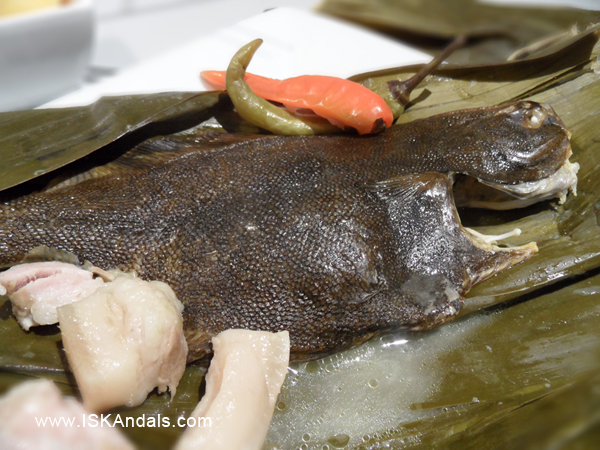 - Feel free to cook longer (at least 4 hours) when using small fish so that bones and head will be soft enough to eat. Add water when necessary. wow this is definitely sooo pinoy. i want my sawsawang patis and a cup of rice… and I will eat Kamayan style. now that’s definitely Filipino! Yes, the fish sauce itself would make one eat more with rice. I have a hard time trying to cut rice when I’m having pinais or pangat. I wish I could do this. I wish my husband would stop skinning and filleting every catfish he catches.. hehe. Looks so good. You can still do this using fillets, Dexie. Or you can wrap them individually with mustard leaves instead and cook with coconut milk. That’s so yum! Nice take on this challenge! You made me miss my mom’s pinais! Wish I could have some right now! When I’m home I always ask for this from my mom. Any pangat or pinais dish from her… ahh comfort food! I love simple native dishes like this that are so packed with flavour and makes you eat tons of rice. Am drooling so much. Indeed, it’s so simple yet flavorful. By the way, I drooled over your kare-kare. And beautifully presented! this is great. I’ve never had this before but I want to try it. Looks delicious. 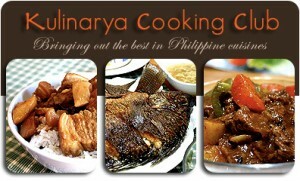 Cherrie recently posted Kulinarya Cooking Club June 2012: Tapsilog. Breakfast of Champions. I love pinais style. Nothing beats banana leaves as cooking pambalot. Pinoy food is the best! I don’t think I’ve ever had this dish before but by the looks of it, it promises to be yummy. That flounder is calling my name. Thanks for stopping by. I bet the banana leaves gives it a lot more flavor! I’m drying a bilao of kamias, but they’ve grown molds as it had been raining for days. I have tulingan waiting in the freezer to become pinais.